International Walk & Roll to School Day – This Wednesday!! You are here: Wade Thomas Parents Association > Programs > All Posts > Featured > International Walk & Roll to School Day – This Wednesday!! 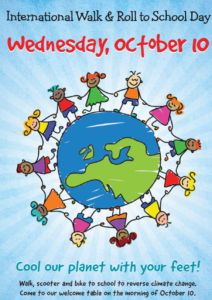 Please join us for International Walk & Roll to School Day on Wednesday, October 10th. Meet at Imagination Park (San Anselmo Avenue at Magnolia) at 7:45 a.m. to walk and bike and scoot to school together!